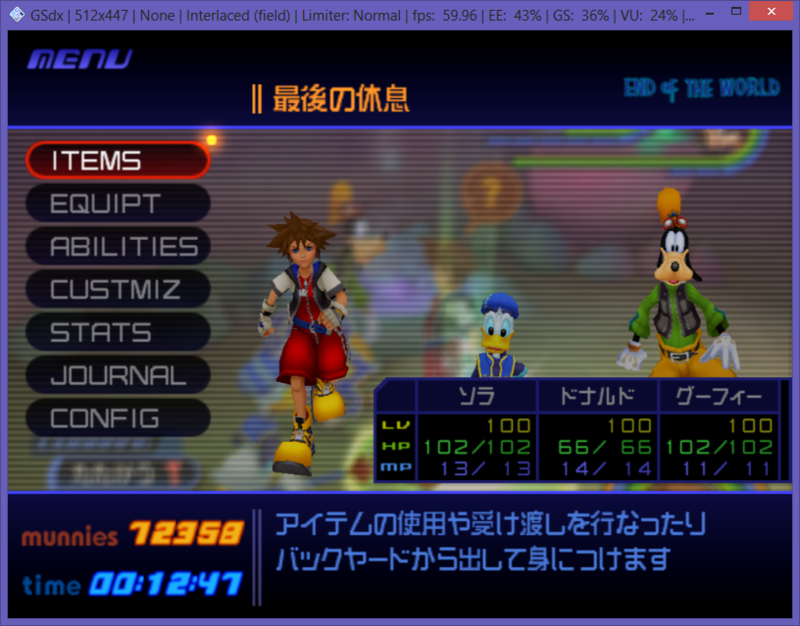 Over the past few weeks, I’ve taken a look at the way text is stored in the game Kingdom Hearts. Like other games made by Square, Kingdom Hearts uses a special character map for strings throughout the game. The US and PAL versions of the game use a character map consisting of Latin characters and common symbols. The Japanese releases use a different table containing Japanese characters as well as uppercase Latin letters (there are a few lower case ones though, but not a full alphabet). Most text is compressed using a LZSS-like algorithm, but I was able to poke around at some of the non-compressed areas. For example, the menu items on the pause screen are not compressed and can be modified if you know the correct characters to enter. So far I am able to change these items as long as my modification’s don’t overlap any neighboring strings.